THE EULOGY By The Reverend Prebendary Carl Attwood. Given at her Thanksgiving Service at the church of St. James The Great, Colwall, On 3 November 2007. ‘Only Connect’ wrote E M Forster famously in his epigraph at the end of ‘Howards End’ and in some way it could be the Pat’s epitaph really. Only Connect - Pat was the most extraordinary lady in connecting in all sorts of ways. It came out of a remarkably curious and interested personality and it was fired by a real interest and love of people, with a result that she was quite extraordinary in that she just connected with so many people in so many different ways and it was a constant source of surprise, encouragement and delight to all of us to be included in quite surprising things from time to time and Pat made all those connections. She was someone who loved the use of language, which was something to do with her training and upbringing. I am sure she would not mind me describing her as an ‘enabler’. It is a word that is used quite a lot and rather cheaply but she genuinely was an enabler because all of the information that she so wonderfully collected made all these connections. She did not use it to manipulate or act as a power base; she genuinely used it to help other people and to involve them evermore in the exciting fairground of life, so you would suddenly discover newspaper cuttings arriving about things you had recently read, or about somebody you had mentioned that you knew from way across the world that she had spotted somewhere. She would ring you up or send you a little note so that she kept all these connections wonderfully alive and made you feel much more in touch with things. She had an extraordinary and quite phenomenal memory, which enabled all this to work as well. I am sure many of you will have seen her at home from time to time in what Nicholas quaintly described as her ‘deep litter’ filing system, within which you could actually see where the workings of some of these connectivities went on. I do not know how Pat ever managed to find the time but she appeared to have read every English and European newspaper written in English so that she would have all these pieces of information which turned up so extraordinarily from time to time. In fact not so long ago whilst I was peering in the Church Times, I had a phone call with Pat’s absolutely lovely wonderful tones down the telephone saying well if you are looking at that photograph you are looking at my mother and actually there was her mother who was the Secretary of Washington Cathedral and there were pictures in the Church Times because they were celebrating an anniversary. That takes us back to her roots in Washington because a significant thing about Pat was that she was American. She enjoyed that. She was not always utterly proud of being American; none of us are totally proud in all the things our nations do but she was a staunch defender of all the things that were good about it and it gave us a great deal of fun to rib her about it. It was a great combination because she brought that really wonderful gift that many Americans have of being completely straightforward. She was totally up-front with stuff, sometimes quite startlingly so and this worked particularly well with the gifts she had got but also being married to such an Englishman as Nicholas, the combination was wonderful and made for a very rich blend. To say that her roots were in Washington is not absolutely correct because Pat was not born there. She was born in Cleveland, Ohio and she was the daughter of Evelyn and Kevin Keegan, which she loved to mention for those of you that make the football connection, clearly a different Kevin Keegan. He was a stockbroker; her grandfather had been quite a renowned surgeon in Newfoundland, in fact the first, so she had quite an interesting upbringing. She was educated first in Cleveland, then at Lowell, Massachusetts, and finally at Wheaton University where she read economics and History of Art, which I guess was a good grounding for the sort of skills she had. As you all know she had a great love of the arts and fine arts but also a very good grasp of how the world worked in general. Perhaps as a marker for how her life was to going to develop, when she was 20 in 1951, she joined a group going to Sussex organised by the ‘Experiment In International Living’ and it was the start of what became almost an annual visit to this country and to Europe until she married Nicholas. The group decided to ride bicycles from Paris down the Loire and it was there that she met Nicholas on a bicycle .... The rest of course is history. However, because Pat was still involved with her work and Nicholas, then 18, was starting his Army career, she returned to the USA and having graduated from Wheaton, started to work at the ‘Congressional Quarterly’, actually a daily, as a political journalist. It is clear that this training honed Pat’s quite remarkable skills in terms of the written word; both the words that you use and the importance in how you use them as well as the way the written word is presented. The care in which the family have gone through this order of service for fear of a finger from a cloud wagging has been quite remarkable. She came back to Europe for various reasons, visiting, travelling and to meet Nicholas again in 1956 whilst working for the US Embassy in London. In 1957 they decided to get married and had an engagement party in Washington at the end of that year. They married in August 1958, seven years to the day after they first met, in St Luke’s, Chelsea and at that point Pat began to live in England first at Cambridge for Nicholas’ final year at Jesus College, Cambridge. Soon after that they lived for a while on a converted motor torpedo boat, named the ‘Grey Goose’, and whilst its address was the Medway Yacht Basin, Rochester, it was actually moored in Borstal, which no doubt she enjoyed enormously and that was where their fist born James came along - born in Borstal! Nicholas’ army career next took him to Germany, where Simon was added to the family and then to Australia for the first time, where Christopher was born in Liverpool, NSW. They returned back to Germany and then to the UK in 1964 with Nicholas then posted to the Technical Staff course at Shrivenham, where the boys had their initial education with Pat setting up a wandering playgroup. In 1968 they went to Chepstow, not so far from here, where Nicholas was a company commander at the Army Apprentice College and in 1970 her story started here in Colwall when they moved to Eynhallow and Nick went to work at that place over the hills that has been through so many name changes. I guess that for all of us then from that date onwards, Pat’s activities in so many things have been known to us all. When they boys were at Ledbury Grammar School, she was involved in many things there not the least being the uniform project. 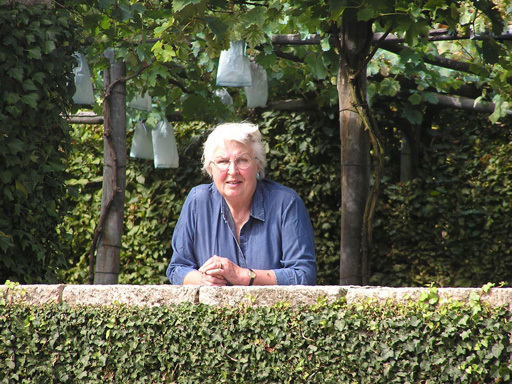 She, as a lover of the arts, was a member of the Malvern Hills DFAS. She became more involved as Chairman and maintained that involvement, as Nick has, with her huge working knowledge of the arts. She was, I think, the first female, certainly the first American, churchwarden we had here in this church, which she loved and really appreciated. She loved to garden, she had lots of talents, but she really did enjoy gardening, the Horticultural Society and Eynhallow garden particularly in then last few months, when she was not getting around as fast as she would have liked to, she particularly appreciated all that was blossoming around her. She always had been particularly interested in youngsters. I know that her family thoroughly appreciated that but so did the village school and Pat loyally went down, as other folk do, to hear the children reading to her, however slow and painful it might be. Pat was wonderful in encouraging youngsters to do that and I think it is a really lovely idea, and it is the first time that I have come across it, that the family felt that, because of Pat’s care of youngsters and her interest in getting them to develop and connect, that the family wish that any monies that are given in her memory would go towards a project for the school and to encourage reading, which I think is a wonderful and creative idea. She was editor of the ‘Colwall Clock’. This suited her gifts enormously; her journalistic training; her facility for detail and the way in which she connected. She was always aware of what was going on around her and quite remarkable in just linking things, as I have said before, all her friends have benefited from it but particularly myself as incumbent, with her as churchwarden and as editor of the Clock, I found it extraordinary. You could ring her up and say ‘I need to think about somebody who would be prepared to.....’ within minutes there was a connection that I would probably not have thought of in five years and it was always nearly smack on. She would notice someone who was in need, someone who wanted to be included; someone who had some gifts that could be developed. It meant that she was a very very effective editor of the ‘Clock’ and I have always been very proud of our community magazine because wherever it is read, people make extraordinary good and encouraging comments about it and a lot of that has been due to Pat’s editorship and what she did with it. She looked after the Church Roll which meant keeping an eye on who was there; she was the Road wardens Scheme organiser; you can imagine that she found that very interesting as well, ably abetted of course by Nicholas using all his computing skills. He set up most wonderful systems, which enable Pat to enter all the information and then rely on her lovely husband to formulate it and put it in such a way to be extracted and used. She loved travelling as was evident and more lately, and in particular since Christopher and Emma were married, Pat developed a huge love of France and decided she was going to get her head around the French language which I think she did with enormous alacrity, with a great deal of enthusiasm and so adding to the enormous pile of French books. They visited France every year and have travelled around the world once. They have been to New York by sea, travelling together on all four Cunard Queens plus the Mauritania. She loved cricket which was useful because do does Nicholas so they used to go to Lords. Then there were movies, the theatre, books and cooking. For somebody who loved people and loved connecting with people, to have loved cooking must have been a great boon because everyone else enjoyed her cooking enormously and anyone who has had the privilege of being at the same table will know what a great treat that was and typically Pat of course; not only would you be fed wonderfully well whether it was impromptu, whether it was a formal dinner party or something in between, she would note who was there, where and when and note what you had eaten. She would also get you to sign the book as well so you would not get a repetition of what you’d had before. She knew what your tastes were; it was all part of the way Pat connected and her awareness of what went on around her. So as I say, as a Wife, as a Mum and as a Granny, I would think she was remarkable; she was on the ball; she rejoiced in all those relationships. She was so proud of her Grandchildren; she would have been so proud of listening to you now. She would always let you know what was happening with the family; a terrific friend, quite extraordinarily so and I think one of the things the boys will remember particularly was that she really enjoyed her boys friends so that when they came, they felt that they had found another mum and quite often the boys themselves would be surprised because Pat would ring them up and say “Are you aware that your friend ‘X’ has written this article in the paper”, or this or that, probably before they would have even known themselves. Pat kept an eye on all these things and I know she elicited enormous affection from that generation of friends and I know quite a few are here supporting that. I think that one of the things Pat really enjoyed doing, combining all of that was providing shoot dinners for the last twelve years. All the friends of Simon got together and had a wonderful time as I know for a fact. I smiled to myself as we walked through the churchyard to put her in her grave that there was a shoot going on, Pat would have appreciated it. She was not without critical faculties in terms of those around her they were never held for long. Pat had certain phrases, which that were interesting and gave her away. The phrase that suggested that all wasn't quite to her liking was 'interesting' out of which flowed quite a lot of other thoughts. Pat was also gloriously open about those things around her. She would be very forceful and strident in what she thought but was very happy to be contradicted and argued with but very often when she had not seen something, she would have this wonderful reaction ... 'Gosh!' she would say. And you could tell that all the critical faculties were switched on and she was listening and watching to see what was going on around her. This place, as I said at the beginning, mattered to her enormously. Underpinning all that she did was an enormously strong faith. It was something that came from her upbringing and it was something that she did not hold piously, I can't think of a less pious lady actually, but through all the events that went on here, Pat was quietly, and sometimes not so quietly, involved in wanting to make sure they happened from the flowers and being part of that, which are beautiful here today, through all sorts of activities, quiet days, Pat could actually be quiet. The family could tell you that. When we first started this off here 25 years ago, Pat was very much involved with so many activities here and for her, the weekly activity of being part of worship really mattered to her. Her weekly sacramental activity here taking communion meant a great deal and so for her this journey, which we celebrate, today actually makes a lot of sense in this building because it is something that featured in all that she did. She did not make a big of fuss about it, but it was clearly what she minded about hugely and underpinned all the other relationships into which she put so much energy and delight. She was extraordinary in the way that she coped with problems. She had both knees replaced at the same time. Some of you may have had knees replaced. It is not the easiest of operations. Pat decided that since they were both needing to be done, she have them done at the same time. That is not common but her progress was just as fast in recuperation as if she had only had just one done. It was not until her stroke, and it was extraordinary because most people get knocked off by strokes and find it very difficult to get back; Pat got back at an enormous speed. She was not prepared to sit around and she was back driving she was back editing the clock and almost no time and the car could be seen in the village, perhaps going a little more slowly but still around actually minding and caring in what went on. One of the ways she used to sign off long before 'emoticons', you know those things you text, became popular she signed herself with a little circle with a smile on it. She will forever live on for all of us who knew her very clearly, her voice, her energy, her encouragement, her love, all those will stay with us for ever but I think that as a symbol that little emoticon with a smile actually is a very nice way of remembering what Pat represented to us in so many ways. I also like to think that where she is now that is precisely the same source of ambience she is bringing to her environment and all I can think of as we say our thanks and prayers and blessings for Pat is that if she is doing half of what she has done for us upstairs then they are benefiting hugely from her company. God bless her.